SKEANIE Loafers are hand made from super soft leather. These shoes feature luxurious leather uppers and lining with a flexible rubber sole. The elasticised ankle means a snug fit with room for growth!. Our sizing chart is meant as an approximate guide only. Please use our printable size chart to ensure the correct fit. Ok, I must say, they are just a perfect pair for my active toddler girl. Easy on - easy off. Very cute and good quality. She wears them a lot and they still look like new. I was even stopped in the mall by another mom who just loved them and wanted to get a pair for her 2 year old. I referred her to your site. Do you give any points for referrals? I love Skeanie loafers in pink! My daughter is almost 2 and she can put them on all by herself. These are the only shoes she likes to wear. They are very comfortable. They look better in person than pictured here. 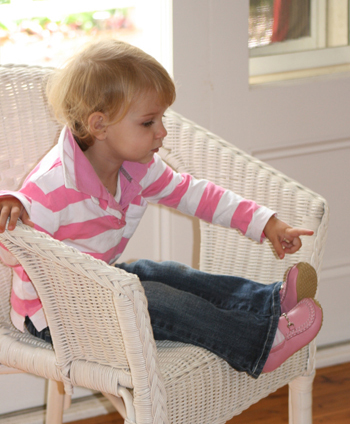 The sole is very flexible - great shoes for a toddler. I am glad we found a perfect pair of shoes for my daughter. I bought these loafers for my 14 m.o. daughter. I got them in size 22 (12-18months as listed here). They fit her great. She has an average size foot, medium width and these shoes seem to fit her fine. There is still room for growth. I love the color too - very nice shade of pink. These loafers are so nice! I am so glad I purchased them. I have a 19 months old daughter and I was looking for flexible sole shoes for her for a long time until I came across these loafers. I couldn't have been happier. They are stylish and comfortable and good for her feet. The fact that they have been endorsed by the Podiatry Association makes me feel good about my purchase. She loves them. We have been getting a lot of compliments. I am very happy with my purchase and I will buy more Skeanie shoes for my child in the future. I'm glad these loafers come in toddler sizes now. I so wanted to buy them earlier but they only came in infant sizes. My 3 year old daughter loves them. Thse are the only shoes she wants to wear. She says they are \"cuddling her feet\" because they ar so comfortable. The quality is amazing and very durable. She wears them to daycare all day long with no socks and her feet don't sweat at all and never had any red marks. I love the look, the quality, and comfort of these loafers.Highly recommend, well worth the money spent on them. I had to write a review for these loafers. We love them! My 12 months old daughter walks in them like she does in her soft soles and they stay on her feet! They are cute, comfortable, and stylish. She wears a size 4 in See Kai Run and size 4 in Skeanie worked out great. Although I wish I found them earlier because she could have worn them longer. I would recommend buying 1 size bigger than your child normally wears. The loafers will stay on their feet and they can wear them a bit longer too. I highly recommend this product. We love the loafers. My 2 year old only wants to wear them. They are easy to put on and stay on her feet. She walks very comfortable in them. I think they are adorable and worth every penny. They are so cute! My 3 year old daughter loves her new loafers. The leather is very soft, the soles are very flexible and the shoes are so light that you can barely feel them. They are well worth the money spent. I agree with other reviews, the shoes are really good. I purchased them for my girls. One has medium width feet and they fit her well, the other has wide feet and unfortunately, they were a little too snug on her. They feel very soft inside too and we love the way they look. I would recommend them to any girl who does not have wide feet.